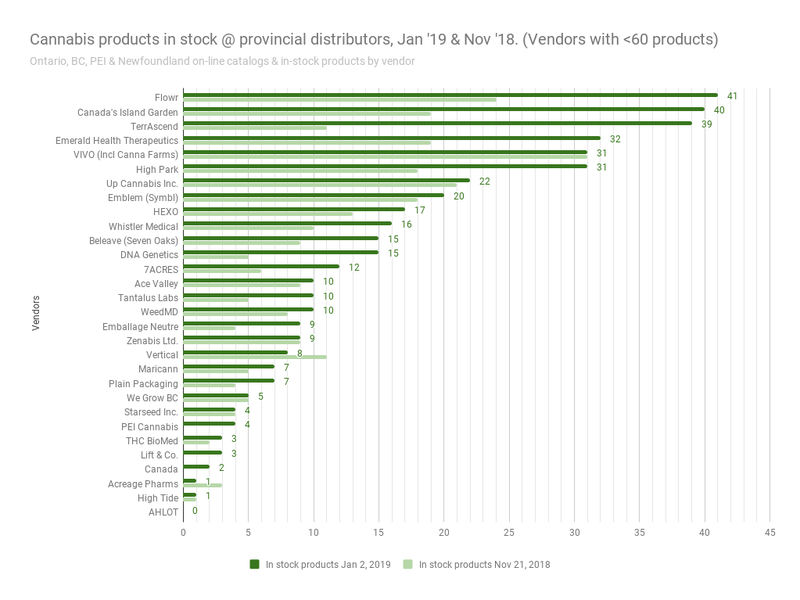 In Canada’s third month of legal recreational weed, Fundamental Hype is proud to present our second look at how the nation’s LPs are stacking up in terms of product mix and product availability at the provincially run e-retail outlets. 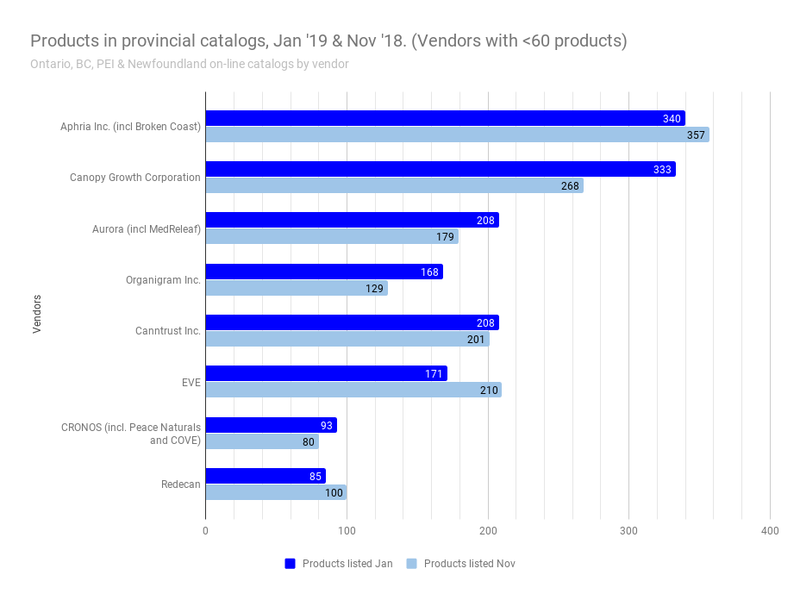 Our data set is based on readings of the catalogs of the BC, Ontario, PEI and Newfoundland provincial online retailers’ catalogs. Because most provincial governments control the totality of legal online weed sales in their own jurisdictions, our sample represents the rec weed available to 53% of Canadians through online sales. We’re using this early data to get a look at the market, and at which LPs are able to offer selection, supply that selection, and grow it month to month. And volume is the whole trick. Aurora Cannabis (TSX:ACB)(NYSE:ACB) took a tumble today, losing $0.36 (-4.4%) to close at $6.36 on 21M shares of volume after issuing guidance that eyeballed their revenue for the first rec quarter somewhere between $50M and $55M. The Globe and Mail reports that it’s a figure below analysts estimates, which they put at $75 million on the high end. Aurora’s release had the audacity to drone on about the company “ramping up to production capacity of…” thousands of kilos per year without saying anything about how much weight they project to have sold in the quarter! We aren’t sure if this is a reflection of IR not understanding what matters, or understanding all too well and not wanting to focus on it. Aphria Inc. (TSX:APHA)(NYSE:APHA) will be the first cannabis company to report in the rec era this coming Friday. Aphria is going to have to CRUSH the 1,778 kg they sold in the quarter ending August if they want to push lingering discussion of self-dealing allegations by short sellers further down the news stack. 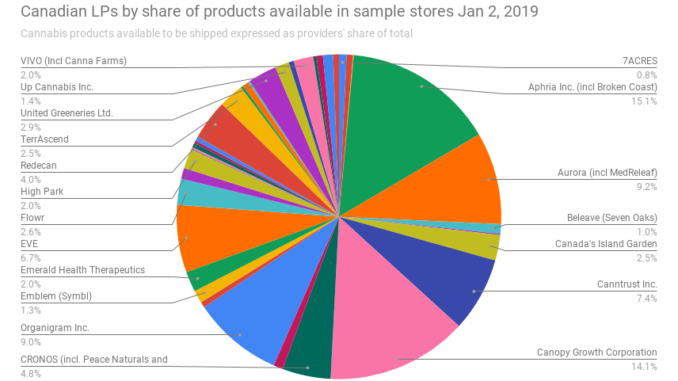 We’re looking forward to seeing if the reported volumes correlate to the number of SKUs these companies are putting in the store, but for now we’ve only got the catalog data. Let’s go to the charts. Watch out for OGI, moving up 3 spots on the in-stock product index in 6 short weeks. The month-over-month product mix hasn’t changed at the top, as big 3 Aphria, Canopy (TSX:WEED)(NYSE:CGC) and Aurora hold strong, but check out number-four-with-a-bullet Organigram (TSX.V:OGI) rocketing up past mid major Canntrust (TSX:TRST) and consumer-focused Eve & Co. (TSX.V:EVE) to find themselves knocking on the door behind Aurora. We short-changed OGI last time around, unaware that the Edison Cannabis Co. was one of their brands. 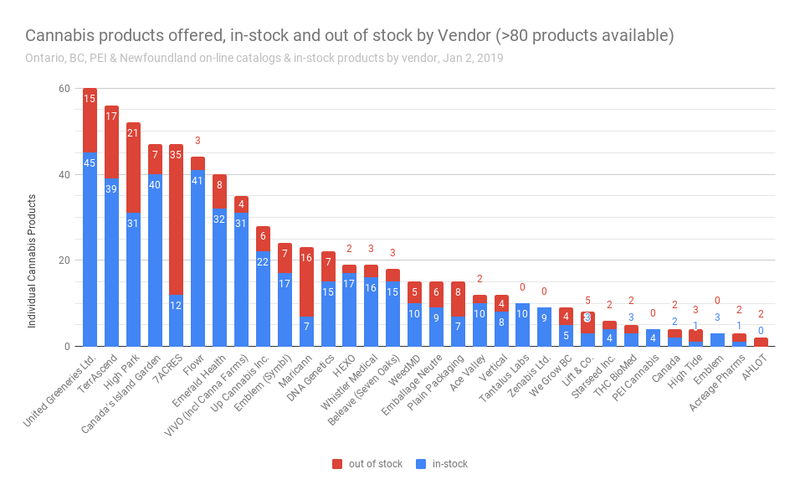 It was only nine in-stock products at the time, but Edison has grown to offer 42 in-stock SKUs in January, so we’re glad we caught it. OGI is looking to bounce back from a production dip in their August quarter. It’ll be interesting to see if this new brand helps. 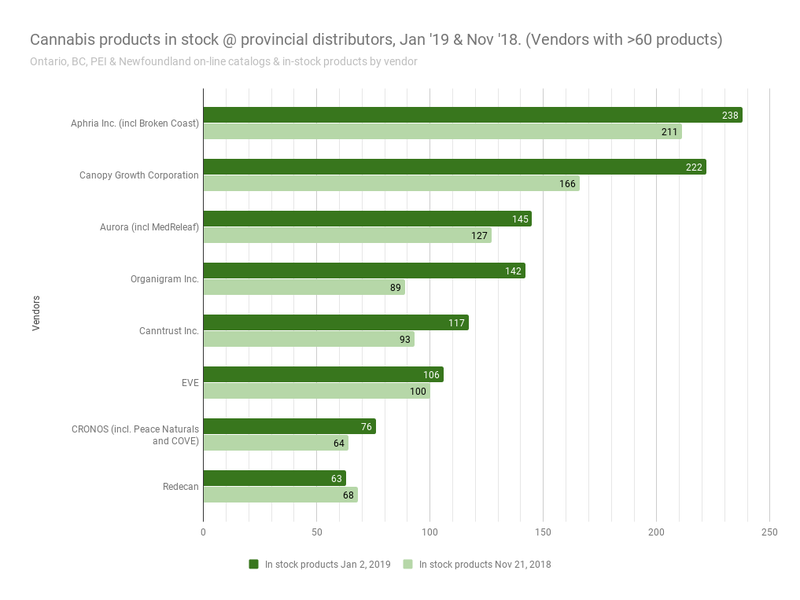 Only Redecan (private) has fewer in-stock products than they did six weeks ago, and it likely has to do with a product recall that they announced November 24th, shortly after we did our first data harvest. Plain Packaging and French equivalent “Emballage Neutre” appear to be generic packaging available at some provincial stores. The products listed under “Canada” are products from High Park brand “Canaca,” misfiled via OCS typo. In the under-sixty-products weight class, we’re down to the 5th spot before running in to a high-volume Cannabis producer. Tilray Inc. (NASDAQ:TLRY) has a put a clear demarcation between their medical product, grown out of Nanaimo, and their recreation cannabis, grown in London, ON at their High Park facility. They’ve doubled their available SKUs in the six weeks since we checked, and we’ll be watching High Park closely period to period to see if they continue to up the product count or level off and focus on volume. It’s our opinion that TLRY has the staff, backing, and profile to be able to assess the environment and change direction quickly if necessary. The biggest product jump in the group comes from Missassagua-based TerrAscend (CSE:TER), who leapfrogged seven of their peers, including High Park, Vivo (TSX.V:VIVO) and Hexo (TSX:HEXO) to come in third. Canopy Growth-backed TerrAscend is offering more of their Solace Health brand in provincial rec stores. 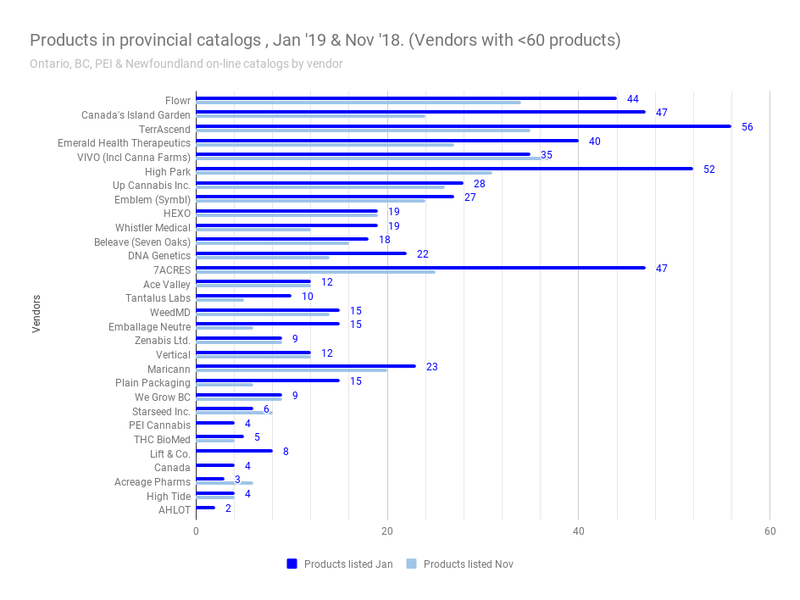 If the provinces are ordering more because the product moves well, look for revenue to jump from the $1.7 million they turned out in the September quarter. Shareholders will also be looking for them to do more margin with greater scale. They were basically flat last quarter. 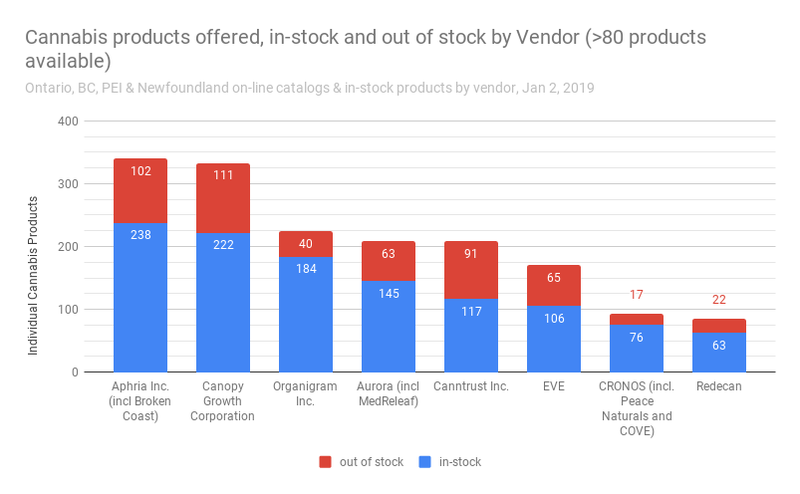 We saw in-stock product count drops from Invictus MD (TSX.V:GENE) subsidiary Acreage Pharms, who dropped from three available products in our sample to one, and from something called “Vertical,” which we haven’t quite been able to ID. Augora Hills, CA based “though leader” Vertical doesn’t appear to be licensed to sell in Canada, and Canopy Growth’s “Vert” property out of Quebec isn’t yet licensed to sell flower. Invictus’ place in the product-mix basement is surprising for a company who has been at it as long as the Gene Simmons affiliated outfit has. Much of their news flow has to do with supply agreements with clinics and export agreements with foreign entities. They always come with big projected numbers, but we aren’t seeing a lot about production yet. We make their available production space at 40,000 square feet; about the same as Supreme (TSX.V:FIRE) and slightly less than Emblem (TSX.V:EMC). Perhaps new CEO Paul Sparkes will be able to put them on track. The only real surprise in either of these charts is that Aph is offering fewer SKUs in the January scrape than in November. We’re not reading too much into change in total catalog size, preferring to focus on the portion of the catalog these companies can keep in stock. Supreme Cannabis product 7ACRES really sticks out here, extending a 47 product catalog but only being able to keep 1/4 of it in stock. The BC Independent Cannabis Association‘s Travis Lane (@BeardedGreenly on twitter), unlike FH’s editorial staff, has actually tried a selection of these products and knows what he’s talking about. He puts 7ACRES’ WAPPA strain in the top tier, so there is a possibility that 7ACRES is moving too much weight to stay stocked. @7acresMJ Wappa is excellent, high quality cannabis by any standards. It would be top shelf in any shop. It stinks when I open it. It looks good and has great trichome coverage. It tastes good, burns right, and has a nice stone. Credit where it is due. Best yet, by far. Supreme figures to report for their December quarter some time in February but, maddeningly, Supreme doesn’t report units sold. The company did $5.1 million in revenue in their September quarter, and signed a deal to wholesale to Tilray. $5.1 million in sales is nearly twice what Organigram did in the parallel period. OGI’s unit sales for that period (ending August) was 349 kg of bud equivalents. Today, OGI shows an enterprise value of $556.4M, so there’s a (shallow) case to be made for Supreme being under-valued at $463.5M. Some unit sales numbers would go along way here. 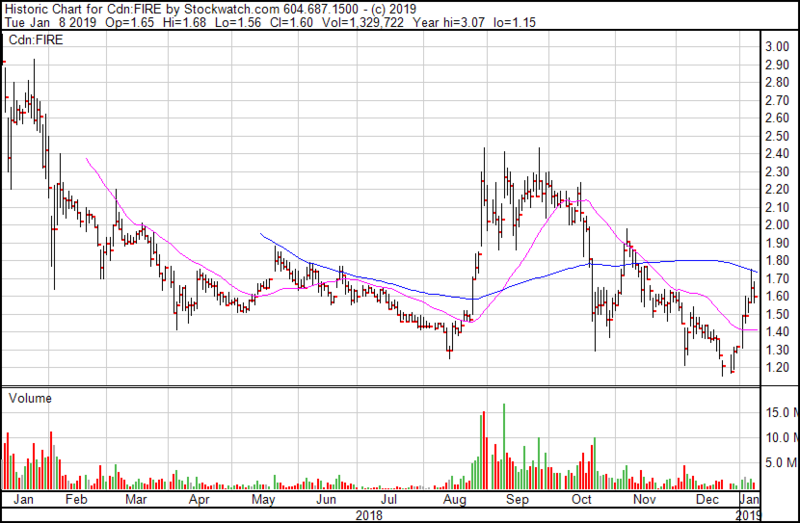 Supreme Cannabis (TSX.V:FIRE) chart courtesy stockwatch. Finally, a quick shout out to BC producers Tantalus Labs and Zenabis, who are the only LPs in our sample capable of keeping their full catalog in stock.